Records are quite sparse for the long period up to the 1970’s but following the reorganisation of local government in 1974 the band changed its name to MORECAMBE & HEYSHAM SILVER BAND. Under the baton of John Fleming, the conductor for many years, the band reached the Section 4 National Band Finals in 1979. The year 1984 signalled the arrival of a new musical director, Stephen R. Tarry, F.L.C.M., G.L.C.M. and almost immediately the band’s contesting fortunes took a dramatic upward turn. The band rapidly gained promotion from section 4 to section 1 Nationally and Championship section in the North West Region. They reached the National Finals in London in 1986, 1987, and 1991. They again played at the National Finals and were placed 3rd in section 2 in 1993, a very creditable achievement. In 1981 the MORECAMBE YOUTH BAND was formed and under guidance of Bernard Vause and Joe Kenyon, the band has provided a constant stream of talented young musicians, many of whom have and still do play with the senior band. In May 1995 The Youth Band were the very first brass band in the UK to receive Lottery funding. The successful bid meant that £47,500 could be spent on new instruments and equipment. Training has always been of high priority and in 1999 the MORECAMBE BAND MUSIC SCHOOL was inaugurated. Records show that in September 2001 it began to operate on Saturday mornings and that in 2005 its name was changed to MORECAMBE BRASS ACADEMY under the leadership of Anna Thackrah. When Anna left in Jan 2007, Carol Blaylock offered to take up the role of Director with an increased staff to cope with the growing number of pupils wanting to learn. Since 1987 the Morecambe Band has had the benefit of sponsorship, firstly through the Marsden Building Society then from 1992 Nuclear Electric, now British Energy (Heysham Power Stations), and from April 2001 to April 2004 Lancashire Life and Lake District Life Magazine. 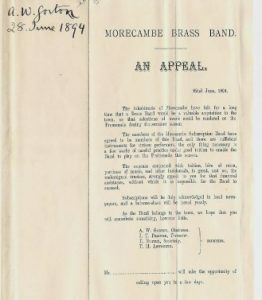 In 2000 the MORECAMBE BRASS ENSEMBLE (MBE) came into being; its purpose was to fill the gap between the Youth Band and Morecambe Senior Band. 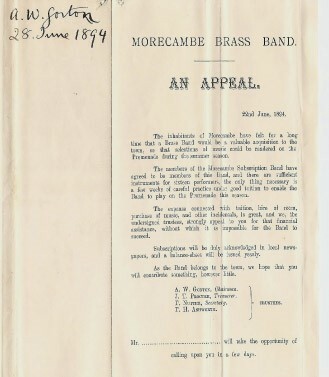 Sadly the changes within the schools music service and the introduction of charges for lessons meant that the numbers in the Youth Band began to fall until eventually the committee decided IN 2010 to amalgamate the Youth band with The MBE, forming a new viable group with a new name and uniform…MORECAMBE BAY BRASS. (MBB) Engagements are undertaken throughout the area and bring much pleasure to players & public alike. Valuable publicity has been generated for Morecambe & Lancaster and the Regional Brass Band movement by the band through several foreign tours. 1990 saw the band on tour in the Lake Constance and Kressbronn areas of Germany and in 1992 in the Moselle Valley region. In 1995 a tour of Holland was undertaken. Throughout the years the band has had several “homes” ranging from Euston Road School to the old Telephone Exchange at Heysham and finally to its splendid headquarters at Birketts Place. The present band room was formerly the City Council deck chair store which was purchased in 1993, superbly converted and renovated mainly by the members themselves, and now recognised as perhaps the finest brass rehearsal facilities in the North West. In the last year we have added such luxuries and a Pool Table, Dart Board and Satellite TV. In September 1998 Steve Tarry married and finally bade farewell to the band and all his friends after 14 years as Musical Director, taking a teaching post in Kuwait. His departure meant the appointment of a new MD, and in September 1998 ANDREW WARRINER was appointed. His experience as a player with Fodens, Leyland, Grimethorpe and others was soon put to good effect when in November 1998 the Band was placed third at the prestigious PILKINGTONS NORTHERN BRASS BAND CHAMPIONSHIPS held in St. Helens, a sure sign of even better things to come. In September 2001 the Band competing in The National Championships of Great Britain at Preston Guild Hall were declared winners at Section 3 level…. the highest accolade in the Band’s history. By winning the Nationals in Preston we were automatically promoted to Section 2 and in the North West Area qualifying Competition in March 2002 the Band performed well again and qualified for the Finals in Torquay. A second National Title however was not to be, the Band finishing in 6th place in Devon. In March 2003, the Band said goodbye to Andrew Warriner as he returned to playing with Fodens. Fortunately a replacement MD was soon to move into the area as a music teacher at a local secondary school. Chris Larder moved to Morecambe in September to take up his first job following graduation at Leeds University where he studied music. Chris has been principal Euphonium player with Rothwell Temperance Band, a Championship Section Band from Yorkshire. In May 2004 the band changed its name to reflect its many and various facets. 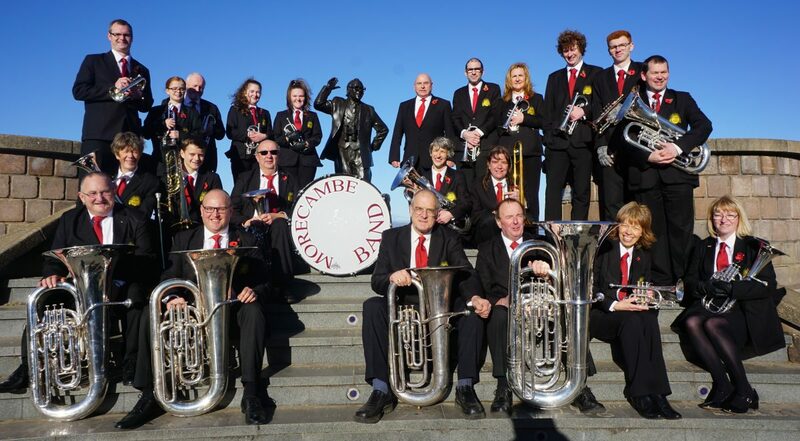 The organisation was re-branded as The Morecambe Brass Band Association, to encompass the Morecambe Brass Band, Morecambe Brass Ensemble, Morecambe Youth Band and Morecambe Brass Academy. July 2004 marked the 100th Anniversary of the Bands’ formation (see top for latest information). To celebrate the event, the Band ran an International Competition for a new piece of music. The judges were to be the audience at the Anniversary Concert in The Dome Morecambe on 10th July. The finalists were selected by an eminent panel of Brass Musicians. Dr Roy Newsome, David Horsfield and John Miller. The winner Andrew Baker of Manchester received a cheque of £1000 for his music entitled “The Cistercians”. In September 2004 our Anniversary celebrations continued with a celebrity concert and master class given by Dr Robert Childs, the world famous euphonium virtuoso and conductor. In the summer of 2005 a group of musicians & friends from the band spent 5 days on a visit to Barcelona, Spain. In 2006 the Band returned after a three year break to contesting again when they entered the third section at Blackpool. In September 2007 we lost the services of Chris Larder as MD as he left to take up new responsibilities in school. Fortunately Andrew Warriner offered to help & subsequently agreed to return on a permanent basis in January 2008. In 2009 the band successfully applied to be registered as a Charity, so opening up the possibility of further grant funding. March 2011 saw the band declared Area Champions in section 2 at the North West Area Championship held in Blackpool. This led to the Band playing in the National Finals at Cheltenham in section 2., when they were placed 6th out of 17 bands a very noteworthy achievement. The Band was promoted to first section in 2012. As part of the 2012 Morecambe Visitor Annual Sunshine Entertainment Awards, the band was voted Winner of the Community Group Category. 2013 was a particularly successful year for the Band. Morecambe achieved second place at the Butlin’s Mineworkers contest and at Brass at the Guild a month later. The hat trick was completed with 2nd place at the North West Areas, and an invite to the nationals in September. The band rounded off the contesting year by winning at Fleetwood. The success continued in 2014, placing 5th at the North West Areas, securing enough points to head up to the championship section. The bands also performed at the inaugural Morecambe Carnival, and were invited to play at the Lancaster Music Festival in October. Finally, Morecambe Brass Band Association celebrated their 125th anniversary. In 2015 the band entered the regionals at Blackpool in the Championship section, the first time ever in the history of the band. In September 2015 it was all change as we welcomed Steve Simpson as Morecambe Band’ s new Musical Director. At the same time we were pleased that Tim Weed ( one of our own front row players) volunteered to take over as MD of both Bay Brass and the Academy band. Morecambe Band continues to entertain at the Platform Morecambe and Happy Mount Park and other events locally in the Summer. Bay Brass have played at local field events and at Torrisholme Methodist church as part of our annual patron’s concert. The Academy continue to teach any prospective brass player of any age and welcome new members.